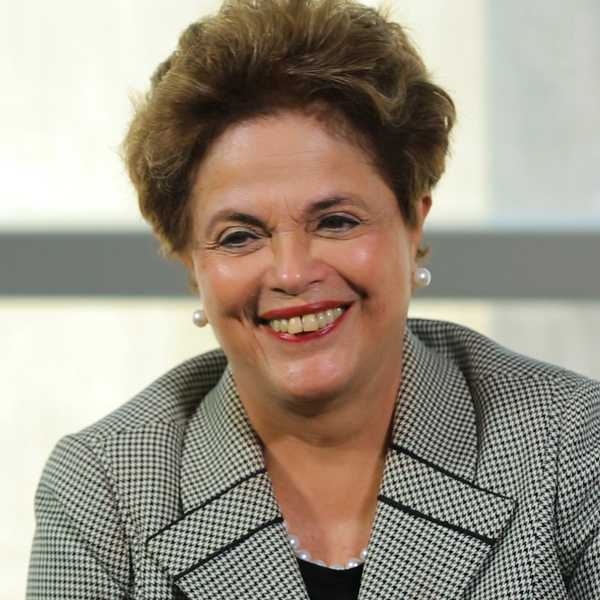 Dilma Rousseff is an economist and politician who was the 36th president of Brazil from 2011 until 2016. She is the first woman to have held the Brazilian presidency. Previously she served as the Minister of Energy and then as Chief of Staff to President Luiz Inácio Lula da Silva, who held office from 2003-2010. Born in Belo Horizonte, Minas Gerais, she joined the underground movement against the Brazilian military dictatorship in 1965 as a high school student and participated in two resistance organizations until she was arrested in early 1970. Brutally tortured for ten days, she served a three-year term for violating the National Security Act. Released in 1972, she moved to Porto Alegre, in southern Brazil, to be near her husband who was still serving time for his oppositional activities. In Porto Alegre, she was involved in the founding of the Brazilian Democratic Labor Party and served as the Secretary of Energy for the state of Rio Grande do Sul under two administrations. In 2000, she joined the Workers’ Party. After the former trade-union leader Luiz Inácio Lula da Silva was elected President in 2002, Rousseff joined his cabinet as Ministry of Energy. Her “Light for Everyone” campaign expanded rural electrification to millions of households in the countryside. In 2005, she was appointed the President’s Chief of Staff and served in that role until being nominated as the Workers’ Party presidential candidate in 2010. She defeated her main rival, José Serra of the Brazilian Social Democracy Party, 56% to 44% in a second round run-off election. In 2014, she received 54 million votes against Brazilian Social Democracy Party candidate Aécio Neves winning the election by a closer 51% to 49% margin. During her second term in office she was faced many challenges in her initiatives to reorganize the Brazilian economy. In 2016 she was impeached by the National Congress for allegedly breaking a budgetary law, removed from the presidency, and replaced by Vice President Michel Temer in that office. Dilma Rousseff retains her political rights and is actively participating in debates about Brazil, both nationally and internationally. She currently lives in Porto Alegre in southern Brazil. As president, what were your goals for Brazil? What do you remember about Brazil’s 1964 military coup? Why have you dedicated your life to the transformation of Brazil? Why did you join the resistance against the Brazilian military dictatorship? How did the 1964 Brazilian coup affect your political values? What policies did you put in place to support women during your presidency? How do gender stereotypes affect women in politics? How did your arrest and torture during the military dictatorship influence your decisions as president? How did you resist and survive being tortured by the Brazilian military dictatorship? What methods of torture were used during the Brazilian military dictatorship? What role did the Brazilian National Truth Commission play in remembering the past and revealing injustices?